Waterford Healing Arts Trust (WHAT) is seeking musicians to join the organisation’s Healing Sounds on the Wards programme, a live music performance programme for and with patients of University Hospital Waterford. The successful applicants will be trained and mentored to bring live music to the bedside of patients by musicians Liam Merriman and Eoin O Meachair. The deadline for submission of applications is Monday 18 February 2019. WHAT established the Healing Sounds programme in 2000 with the aim of reducing stress and anxiety for patients, staff and visitors of UHW through live music. 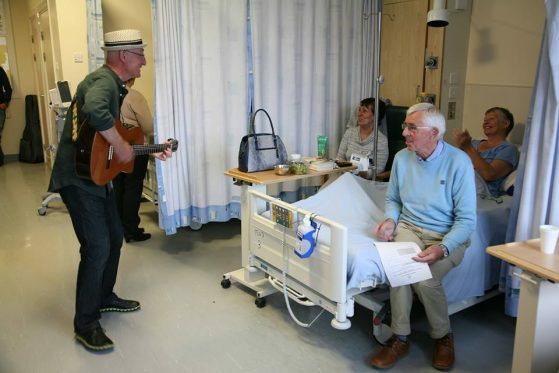 The programme involves a range of musicians and musical styles and, where appropriate, encourages patients and staff to engage with the musicians. In 2014, WHAT introduced mentoring for musicians and has since mentored six musicians to work in hospital settings. Healing Sounds on the Wards is funded by the Arts Council and the National Lottery Good Causes Fund. Further details are available from www.waterfordhealingarts.com or (051) 842664.